Facebook is currently testing a Downvote button for comments. This isn’t a Dislike button, or even a Reddit-style Downvote button that lets the mob influence visibility, but it is a way for ordinary Facebook users to flag a comment for moderation. Which is a start. For years now, Facebook users have been asking for a Dislike button. 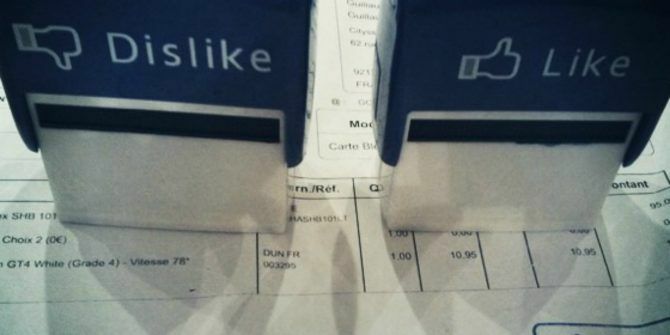 This would be the opposite of the iconic Like button, and let you show your disapproval for people’s posts. Instead, Facebook introduced Reaction buttons What Are Facebook's New Emotive Buttons Really Like? What Are Facebook's New Emotive Buttons Really Like? Over the past few weeks I've been watching as Irish Facebook users reacted to, adopted and used the new emotive buttons. Here's what I found. Read More , but Dislike was absent. And now it’s testing a Downvote button. Some websites are trying to imply this is the fabled Dislike button people have been requesting for years. But it isn’t. A Dislike button would let you give a thumbs-down to content you don’t like, whereas this Downvote button lets you flag a comment for moderation. How Does Facebook’s Downvote Button Work? In the test, hitting the Downvote button on someone’s comment hides that comment for you but no one else. You’re then offered the chance to flag it for the attention of a moderator, with reporting options including “Offensive,” “Misleading,” and “Off Topic”. As Facebook has clearly stated, right now, this is a small test visible to a handful of users in the U.S. However, if it’s ever rolled out fully, it would allow you to Downvote comments you feel are inappropriate in any way, but crucially, for you and only you. Facebook tests new features all the time, and not all of them get adopted. However, a Downvote button for comments makes sense, making it easier for people to hide comments and flag them for moderation. I’d still prefer a Dislike button myself, but that’s never going to happen The Media Lied to You: It's Not a Facebook "Dislike" Button at All The Media Lied to You: It's Not a Facebook "Dislike" Button at All The world is on fire with rumors of Facebook recently announcing a "dislike button". But it won't be a "dislike" button at all. It will be something much more than that. Read More . What do you think of Facebook testing a Downvote button for comments? Do you like the way it works? Or would you prefer Downvotes to rack up as they do on Reddit? Are you still holding out hope for a Dislike button? Please let us know in the comments below! Explore more about: Facebook, Online Commenting.